Named after the town of Aylesbury in Buckinghamshire. 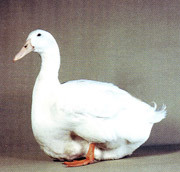 Excluding the Muscovy, it is the only breed of domestic duck which has not got a more or less yellow skin, its skin colour being pinkish white. It was first shown in England in 1845.